Powers/Abilities: Goliath's growth serum enables him to increase his size and grants him superhuman strength and invulnerability. Since Professor Hank Pym of Project Cadmus assisted him in the development of his serum, it is very likely that Goliath's ability to increase his size and strength was made possible by the same Pym Particles that bestowed similar powers upon the villain known as King Lizard. (Judgment League: Avengers (vol. I)#2) - Oliver Queen, who was helped in the development of his growth serum by Professor Hank Pym of Project Cadmus, made his first on-panel appearance as Goliath. (Judgment League: Avengers (vol. I)#4) - Along with fellow heroes Angelhawk (Warren Hall) and Canary (Dinah Barton), Goliath discovered the body of the World War II hero known as Super-Soldier (Clark Kent) in suspended animation -- frozen in an iceberg in the Northern Atlantic Ocean. The shocked heroes carefully defrosted Super-Soldier's body, discovering to their delight that he was still alive after all these years. Finally back in action, Super-Soldier joined forces with Goliath and the other assembled heroes and formed the Judgment League: Avengers. (Judgment League: Avengers (vol. 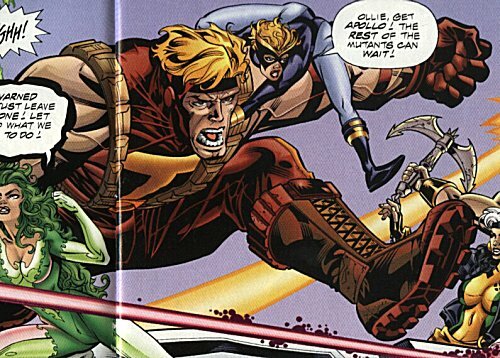 I) (bts)) - Goliath began a romantic relationship with fellow JLA member Canary, although Canary found herself torn between Goliath and Hawkeye (Clint Archer). (Secret Crisis of the Infinity Hour) - Along with the other members of the JLA, Goliath was transported to Apokolips by Doctor Strangefate (Charles Xavier) in order to fight the forces of Thanoseid during the Secret Crisis of the Infinity Hour. (Secret Crisis of the Infinity Hour#7) - Near the close of the Secret Crisis of the Infinity Hour, Goliath was among those heroes present as American Girl (Carol Barnes), the former sidekick of Super-Soldier, heroically sacrificed her life to further the heroes' cause. (Judgment League: Avengers (vol. II)#122) - "Trial of Mariner" - The metamutant member of the Judgment League: Avengers known as Aqua-Mariner (Arthur McKenzie) was framed for the destruction of three Roxxon oil freighters, a heinous criminal act which was actually perpetrated by the metamutant-hating madman known as Will Magnus. Given Aqua-Mariner's longtime personal war against surface dwellers who would harm his undersea habitat, the United States government automatically labeled him an "eco-terrorist" and sent in an army of troops to apprehend him without so much as an investigation. Goliath and his fellow non-metamutant members of the JLA eventually captured Aqua-Mariner and imprisoned him without trial. Outraged by the manner in which their fellow metamutant was imprisoned without trial, most of the metamutant members of the JLA, under the guidance of the mysterious New Gotham power broker known only as Mr. X (Marco Xavier), freed Aqua-Mariner from JLA custody and set out to find the lost city of Atlantis, the legendary city of Homo Superior, under the surface of the Atlantic Ocean. But Goliath and his fellow non-metamutant members of the Judgment League: Avengers were not about to give up Aqua-Mariner without a fight . . .
(JLX#1) - "A League of Their Own" - On the stormy waters of the North Atlantic Ocean, Goliath and the Judgment League: Avengers engaged their former teammates -- the band of renegade metamutants now known as the JLX -- in an attempt to capture the metamutant Aqua-Mariner, who was wanted for torching Roxxon oil tankers. 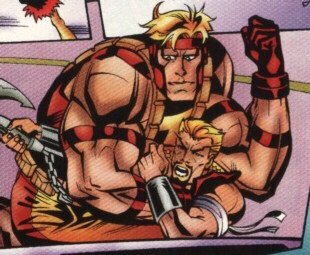 With fellow JLA member Canary perched atop his shoulder, Goliath leapt aboard the JLX Wavecruiser and attempted to subdue the JLX member known as Apollo (Ray Summers). But Goliath was intercepted by Runaway of the JLX, who used her metamutant abilities to absorb Goliath's powers (much to the disbelief of Goliath, who did not think that his former friend would do such a thing to him). 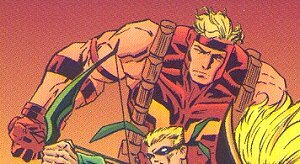 Once Runaway was temporarily disabled by once of Hawkeye's stray arrows, Goliath engaged Aqua-Mariner in battle. But after Angelhawk (the JLA member who was secretly a metamutant in league with Mr. X) feigned a broken back, Super-Soldier instructed the Judgment League: Avengers to retreat, vowing to bring Aqua-Mariner to justice another day. made his first Avengers appearance in AVENGERS (vol. I)#2) and DC's JUSTICE LEAGUE OF AMERICA (DC's Green Arrow became the first non-founding member to join the JLA in 1961's JUSTICE LEAGUE OF AMERICA (vol. I)#4). Special thanks to penciler Matthew Haley for identifying Goliath (Oliver Queen) as one of the characters present at the death of American Girl (Carol Barnes) in SECRET CRISIS OF THE INFINITY HOUR#7. Thanks to Charles Ellis for pointing out that Goliath was an amalgam of Green Arrow/Goliath (Hawkeye) and not Green Arrow/Goliath (Hank Pym).